The flicker of the fluorescent lights help sophomore Kate Claburn keep her eyes open. School feels like a massive feat to her, and the five hours of sleep she got does not leave her rested enough for her day. Claburn sits up straight to stay awake as her head pounds and remains foggy. Claburn’s homework each night takes three to five hours to complete. Three nights of the week she has band practice and doesn’t get home until 7 p.m. Claburn goes to bed at 10:30 or later making it hard for her to get up in the mornings. Claburn forces herself to go to school, despite often feeling unwell from the exhaustion, because she doesn’t want to lose her opportunity to exempt her exams. Sophomore Luke Barnes also struggles with sleep deprivation. He has grown accustomed to getting little rest, but it still impacts him. One time, Barnes remembers bubbling in most of the wrong answers on a scantron even though he had circled the right ones on the test. Barnes rarely gets to sleep before 2 a.m. Homework deadlines, carrying out his leadership responsibilities as a FFA Vice President and keeping his show steers alive consumes his life. Electronic devices play a large role in sleep deprivation. The screens of smartphones and other devices emit blue light which confuses your brain into thinking night has yet to come. Counselor James Bedwell believes students could prevent this by staying off of electronics at least an hour before sleep. For teens this causes problems since homework gets assigned digitally now. Sleep deprivation affects all aspects of life. While driving, fatigue causes approximately 72,000 crashes a year. For youth today, it increases stress, anxiety, depression, aggression and worry. He believes time management, self-discipline and a regular sleep schedule will help teens get proper rest. Claburn, like 87 percent of other teens, suffers from sleep deprivation and an irregular circadian rhythm. 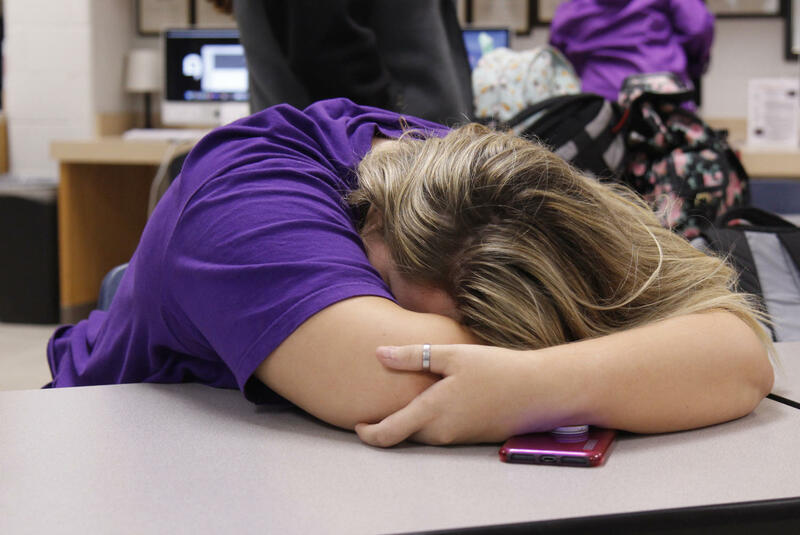 When teens don’t get the recommended eight to 10 hours of sleep each night, they become more prone to mental health disorders such as depression and anxiety. Inadequate sleep also limits a teen’s ability to learn, listen, concentrate, solve problems and remember due dates for homework. Claburn credits her sleep issues to the workload caused by her upper-level classes.